Tatsuro Miller is a meticulous perfectionist. Armed with Hip Hop as his weapon of choice, his experimentation with Electro, House and Soul makes his sets highly entertaining. Being a very technical DJ, Tatsuro’s surgically crisp scratches and tricks makes him a wizard on the decks. Having performed to various different crowds and produced songs for a list of local and foreign artists (Nadhira, Dumbfoundead). Tatsuro is currently the title holder of Best Turntablist in Malaysian DJ Battle 2012. This mix was recorded live at Red Bull Thre3style Malaysia on 8 March 2013. 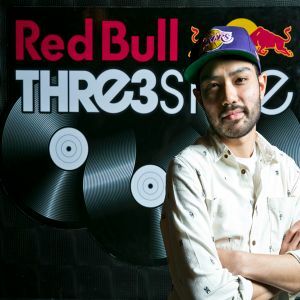 Red Bull Thre3Style is a DJ contest that promises to be a night of dance-floor mayhem. The participants have to play a selection of at least three genres or styles of music in 15 minutes. It doesn&apos;t matter what genres of music are chosen so long as the DJ can make them work together.